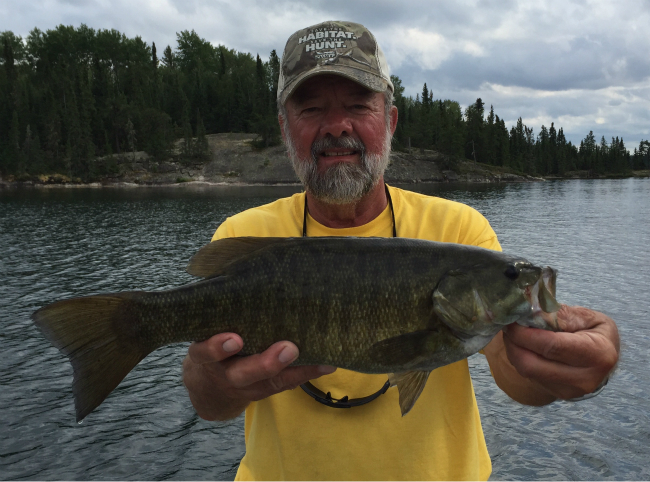 The Ontario Pike fishing is unbelievable at our Gordie Lake Outpost. 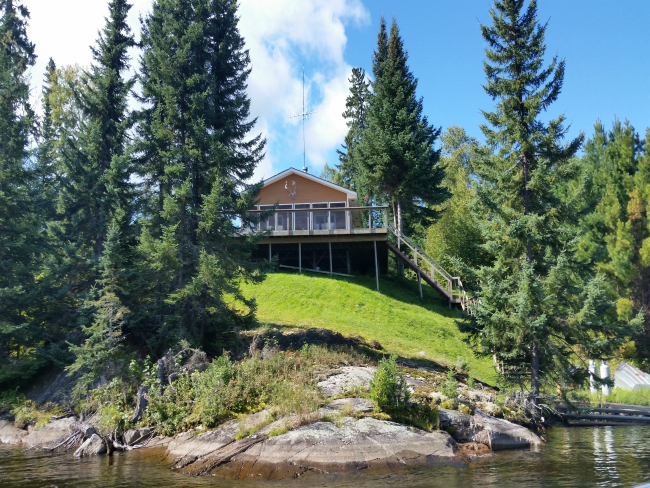 Deep in Northwest Ontario, 53 air miles to the north we have a newly built fly-in outpost cabin just for you and five of your closest fishing buddies. Gordie lake is part of the Campfire River system. Guests can expect to catch up to 100 fish a day on this system. Gordie lake is loaded with scrappy northern pike and has a few walleye in the bays. This fly-in outpost lake has dark water with lots of structure to fish. Throughout the lake you can find a waterfall, some rocky outcrops, pencil and cabbage type weed beds. 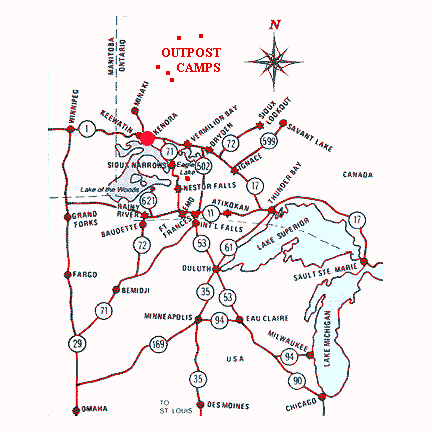 This lake is a flowage system and empties out to the south across from the outpost cabin. The lake is in two parts. The upper portion is 2-1/2 miles long and has the river dumping into it, over a small set of rapids. Across from the outpost cabin is the outflow that you boat down and go into the second part of this secluded lake. It is a big heart shaped body of water with rock and weed beds and is about 2 miles across. The river continues south from this part of the lake. We are the only outfitter on this system and it is the only fly-in cabin on the lake. The average Walleye is 1 to 2 lbs with larger ones caught in the 5 lb. 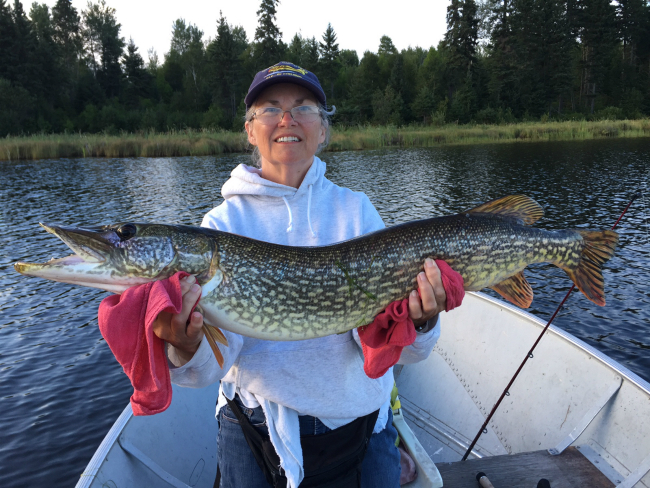 range and Northern Pike are 24 to 30 inch average with 40 inch plus fish caught. The lake had not been used as an outpost in over 15 years. We had fished it on occasion as a boat cache lake and then the last few years we’ve had limited number of fishermen with good success and great numbers. Gordie Lake is one of our best Northern Pike Fishing lakes because of the Campfire river system that runs through it. This Canadian fly-in outpost cabin is five star, with two bedrooms that sleep six people comfortably. 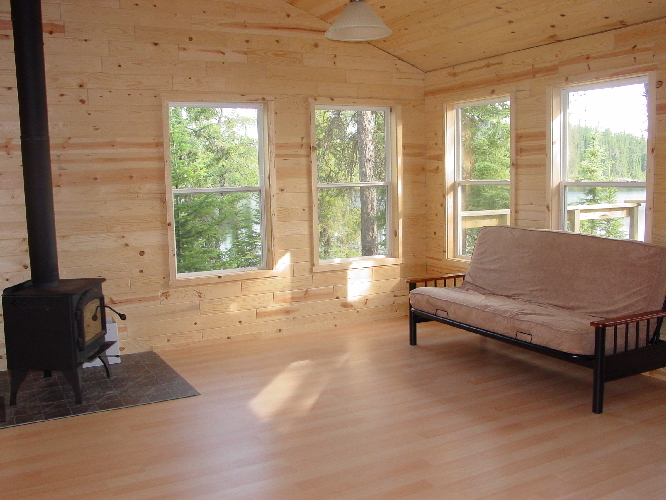 The living room/dining room is open concept with a woodstove and futon in the living area. 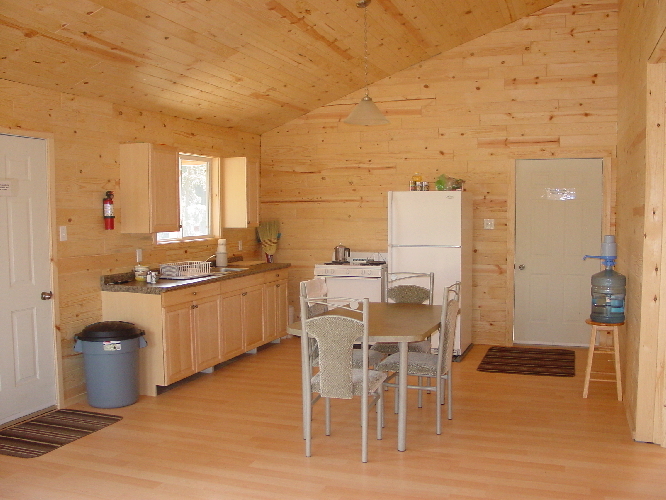 Large bright kitchen has propane stove, electric refrigerator, hot and cold running water and solar electric lights. All cooking utensils are provided. There is a bathroom with shower and sink. There is a backup generator for lights. A large screened in porch out front facing south on the lake, as well as a deck to spend some time relaxing when not out fishing. We have a propane barbeque and fish cooker located outside for you to use. There is a fish cleaning table by the lake. We have all new boats and motors at this outpost lake. We are using 14′ boats with 6 hp Yamaha motors. The boats have raised swivel seats, landing nets, paddles, life jackets and bait buckets.